Join us on this gourmet getaway to the rugged vines, age-old olive groves, and intriguing hilltop towns of Puglia and Basilicata. Together we will uncover the bounty of Puglia’s agricultural heritage and fine artisan food traditions from capocollo and burrata to the sun kissed produce of the Salento, before sampling the region’s prized Extra Virgin Olive Oils crafted from ancient varietals. 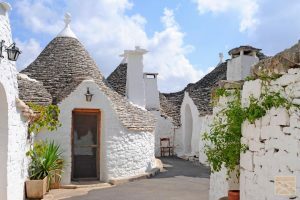 We will explore the enchanting trulli dwellings of Alberobello, the brilliant whitewashed Old Town of Ostuni, and the architectural splendors of Martina Franca, before cooking typical Apulian cuisine in the Baroque masterpiece that is Lecce. From sampling bold Negroamaro and Susumaniello to sipping luscious Primitivo vintages in Manduria wine country we will travel to the otherworldly landscapes of Basilicata to experience its antique baking traditions and rustic culinary heritage as we discover Matera’s mysterious, honeycomb network of ancient sassi caves. This gourmet tour has been designed exclusively for The Tree & Vine by our travel partner, CountryBred. PRICING Pricing is $4,995 per person, based on double occupancy. Please note: Due to the exclusive nature of our accommodations this tour is double occupancy only. The group rendezvous point for the start of the tour is Grande Albergo delle Nazioni in Bari. To book your pre-tour hotel stay at Grande Albergo delle Nazioni on October 23rd, 2019, please contact CountryBred at info@countrybred.com. To reserve your spot on this exclusive tour for The Tree & Vine, please refer to the following steps. The group size for this tour is 14 people. Step 1: Please contact Paul Karlsson of The Tree & Vine at paul@thetreeandvine.com or 865-985-0524, to make arrangements for submitting your trip deposit. A deposit of 50% of the total trip cost ($2,497.50/per person) will be required as the first step in reserving your spot on the trip. Once your trip deposit and Group Traveler Agreement Form have been received, your spot will be reserved on the trip. Should you have any additional questions regarding your reservation and the submittal of your deposit to The Tree & Vine, please contact Paul Karlsson at paul@thetreeandvine.com or 865-985-0524. Should you have any questions regarding the submittal of your online Group Traveler Agreement Form, you can contact CountryBred at booking@countrybred.com or 1-800-615-3543. Trip Balance Payment Trip balance is due to Paul Karlsson of The Tree & Vine by no later than August 15, 2019 (a little over 60 days prior to tour departure). Payments may be made by MasterCard, Visa, American Express, Discover, or by check made payable to The Tree & Vine. If you cancel after September 20th, 2019 all monies paid will be non-refundable Trip cancellation must be made by calling The Tree & Vine at 865-985-0524 and must be followed up by written confirmation via email or mail. Please note that itineraries and itinerary verbiage, supplemental tour information, flyer design, proprietary copy and copyrighted photos are to be used exclusively for promoting the CountryBred and The Tree & Vine co-branded small group gourmet tour.